Over January you have the chance to purchase a 3Cs print (or more if you feel that way inclined). Orders will be taken throughout January then the order totals will be tallied and printed, signed and editioned accordingly. 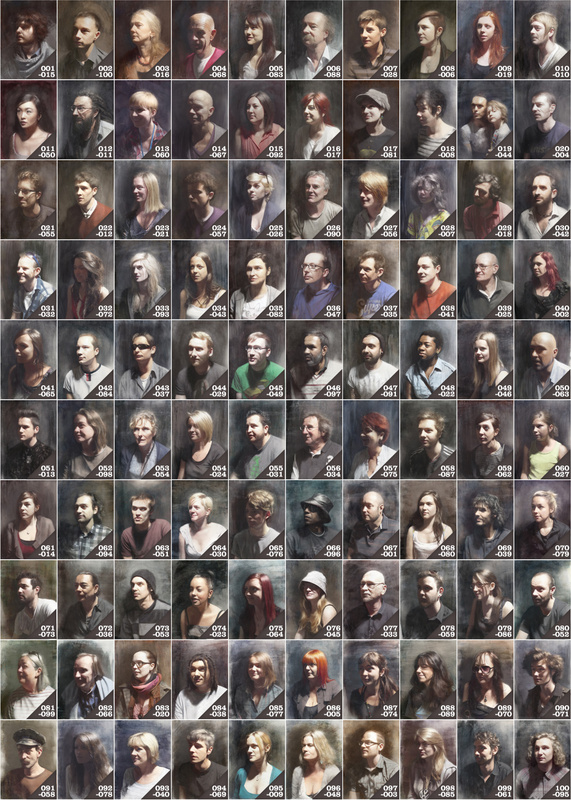 Below is the grid of all 100 portraits and their number IDs. 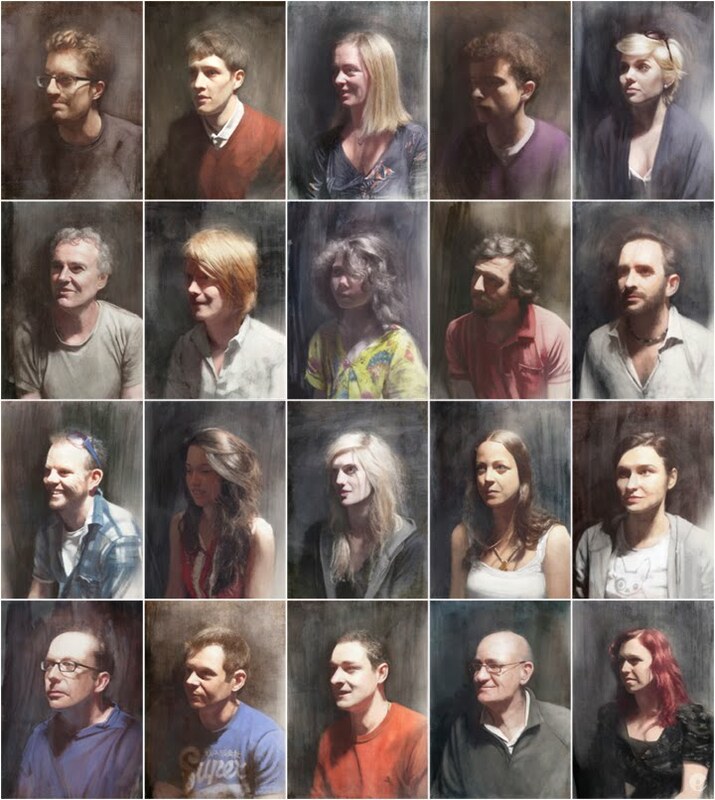 To keep this as simple as possible, there is a link below to buy one print- at checkout you have the ability to tell me the ID of the portrait you would like (please ensure this is completed!). Prints will be produced at 8x10" with a border for framing, signed and editioned on heavy cotton rag stock and shipped out flat in card mailers. 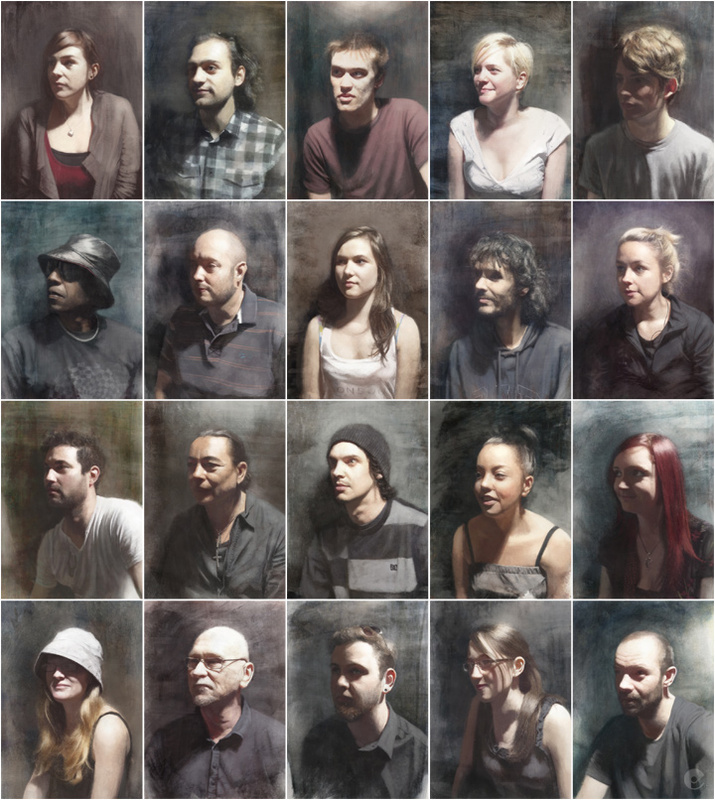 Each portrait costs £25 including shipping. Buy a 3Cs portrait here! Thanks again for viewing over the last few months and again, a big thank you to all of those involved! Happy New Year as well by the way! 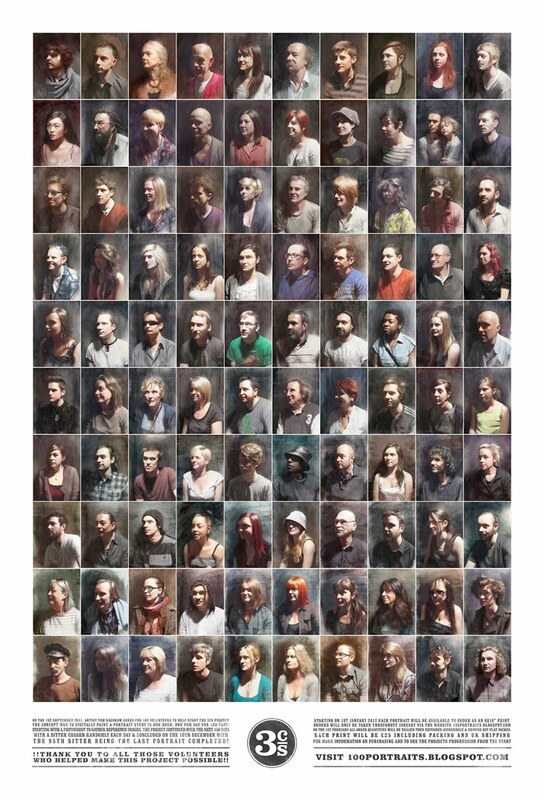 Here we go, after 100 days and around 150 hours of work later, 100 digitally painted portraits! 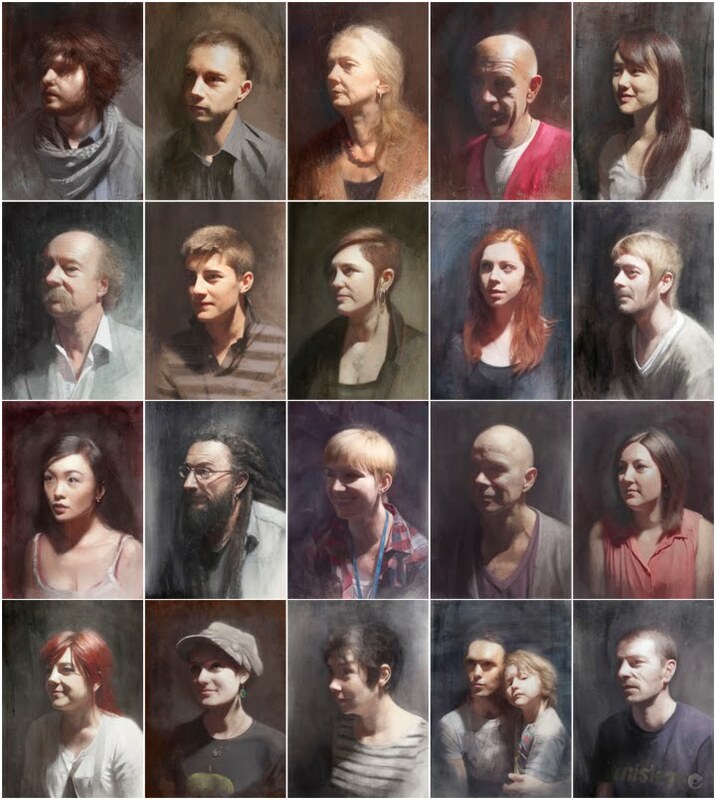 It certainly feels good to see them all together like this and to be able to see how the colours, textures and variety of sitters gets tied together with the strong lighting and seated position. I would like to say a big thank you to all those 100 who voluntered (or in the case of a few- coerced) to be a part of this project! This poster is on view at the Fine Art Print Company in Bath where the photoshoot took place. The text is explaining the project but also gives details of whats happening next. Starting January 1st 2012, each portrait will be available to order as a 8x10" print, orders will be taken throughout January and end on the 1st February. The orders will then be tallied and the prints will be produced and editioned accordingly. Each will be shipped out in a stay flat mailer, with any luck within the week. So if you would like to order your own portrait or the portrait of a friend involved will be able to do so- this is a timed print run so youve only got January to place the order! The order details will appear here on the blog in the next couple of weeks. I mentioned this previously but in case you missed it, i generally paint using Painter IX.5 but in order to produce what i had hoped to be a 1 hour portrait study i chose to use Photoshop CS2. This enabled me to create and use a variety of textured brushes and quickly add layers of texture to create depth to each image. Of about 20 or so custom brushes i actually ended up just using a core of 5 brushes for most pieces! I also utilized the grid method to block in the primary shapes of light and shadow using Photoshops handy grid display. Even though these things certainly cut out a lot of time- it still wasnt enough to bring the portrait within my 1 hour time limit! Each portrait was painted at 300dpi at A5 size (approx 6x8"), below you can see 3 i was really happy with (some definitely ended up being better than others!) and below that a section of each at 100% size so you can see some details a little better! So there you go, thats mainly the end of the project, im hoping to produce a book of this at some point in the new year, in the meantime, dont forget to check back in January for the chance to purchase a print! Thanks again to all those involved and thank you for viewing! And there it is, 100 days after starting the project i have managed to produce 100 portraits, admittedly not so much 100 hours worth of work- more like 150 in all i guess, but at least my main goal was achieved, 100 digitally painted portraits in 100 days. Im just posting up the last 20 here but will add a fuller post with all the collected works in a bit! 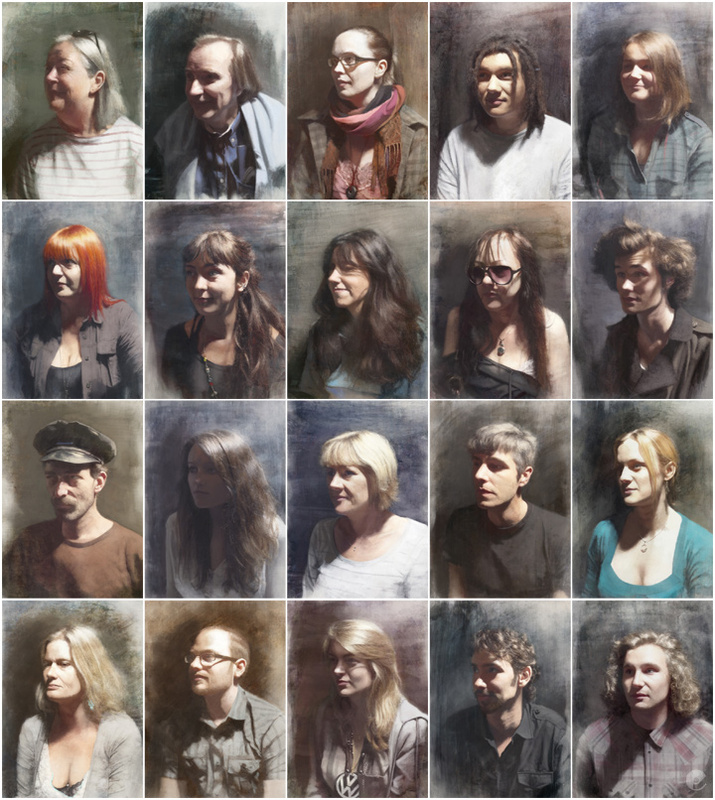 Slowly but surely theyre coming along, heres the next 20 portraits grouped together. I still havent been able to cut down the time theyre taking, but as i mentioned in the previous post- im not too worried about that. Some are certainly proving more difficult than others and im having to miss out a few details here and there- something that i would really want to add in if it was a more finished piece, but even so, im pretty happy with how theyre turning out. See you again in another 20 days! 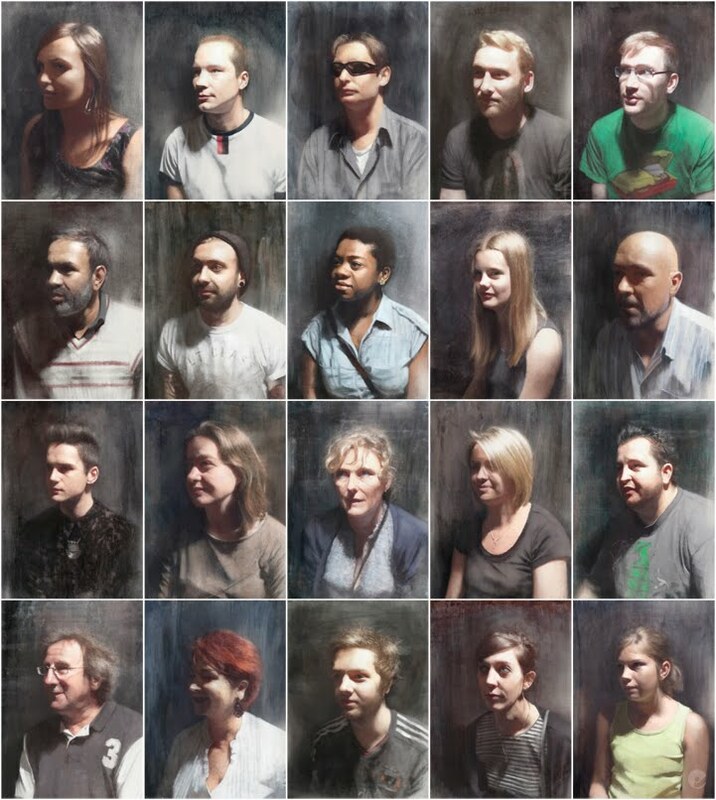 Well technically 22 but anyway.. heres the first 20 random portraits from the 100 volunteers. Thank you all again, hopefully this will all look pretty cool when its all collected together! As i said in my previous post- im picking one person per day by generating a random number from 0-100 but in the grid they run day one top left, left to right, row by row. I also mentioned that so far i havent been able to get these under and hour, one or two have come very close but for the most part theyre taking 1.15-1.25 or so, its not something im going to stress about- i would rather each came out like this than really roughly blocked in. Look out for the next 20! 100 hours, over 100 days. For more information please read the first blog post. Unless otherwise noted, all images Copyright © Tom Bagshaw. Strictly no use or reproduction without written permission.